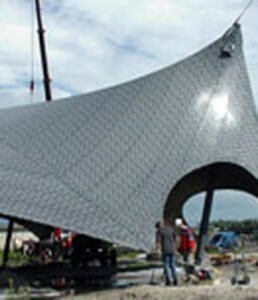 A temporary railway station canopy is a site as a part of a masterplan designed by Toyo Ito for the City of Groningen. The site explore the theme of nomadic inhabitation. The station canopy is a demountable tent with a camouflege pattern that mimics the leafy sourronding of the site.